1. Prayer flags above Wamrong: This is a spot where I used to sit and meditate from time to time. It wasn't hard to find peace in Wamrong, but this place was exceptionally tranquil. I myself am Buddhist, after many years of living like one without really thinking about it. One of my favourite aspects of the philosophy is the way Buddhists seek to cooperate with, rather than overpower, the natural world. I remember taking a drive with Chimi, my dear friend and neighbour, one day and seeing him get genuinely upset to see road work going on during a holy day. His concern was that the road workers would surely kill or injure insects while they were digging. 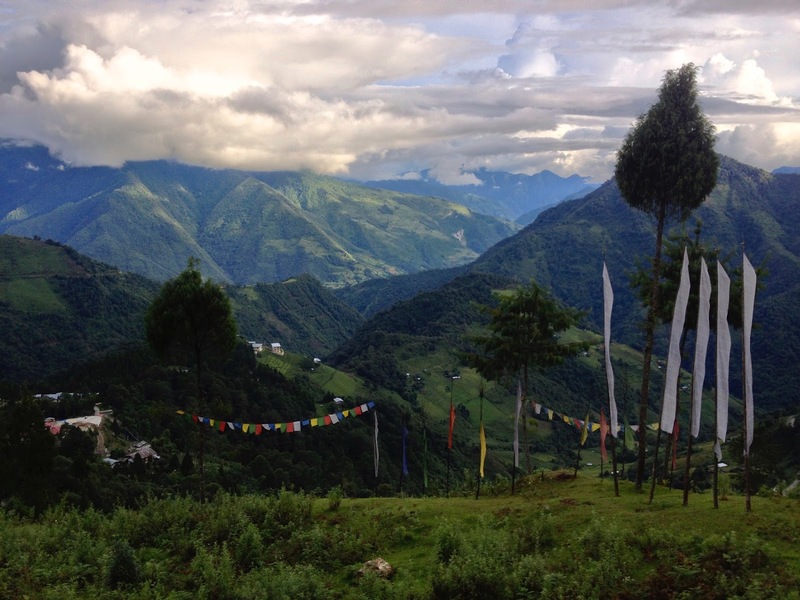 I think the way the prayer flags in this picture accentuate rather than pollute the view is a perfect allegory for the way Bhutanese lived: part of, rather than separate from, the natural world. 2. Darshing perch, Wamrong. If the first photograph shows how the human residents of Bhutan viewed themselves as part of the natural world, maybe this one shows how animals considered themselves part of the human world as well. 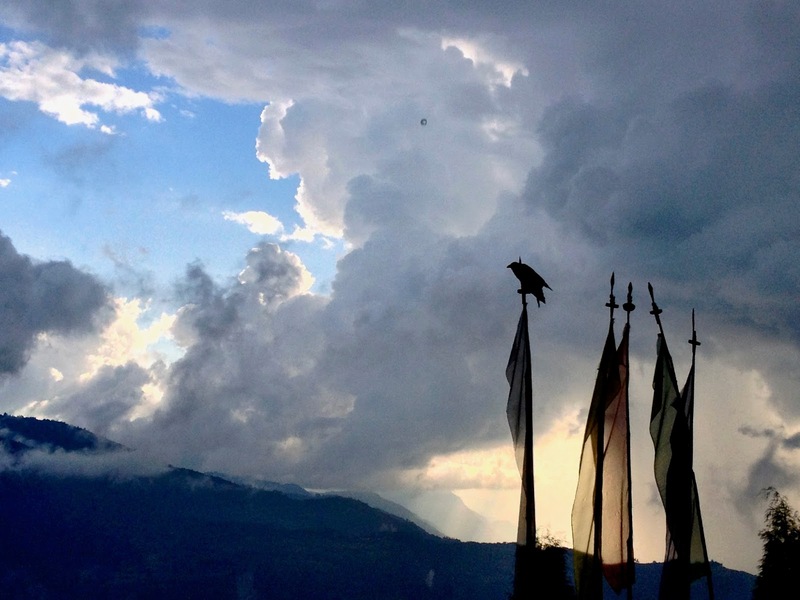 These darshing (larger, upright prayer flags) were right outside the front door of the room where I lived, and almost every day a crow would come and sit like this to survey the valley below us. In the mornings, I didn't need an alarm clock because soon after dawn, crows would land on the corrugated metal roof above me, screeching along with a sound like nails on a chalk board, if that sound were to be pleasant and charming. Friends of mine that lived closer to the jungle had to contend with langurs mobbing their house in the autumn. The animals didn't fear humans because Bhutanese consider it a sin to hunt or fish. 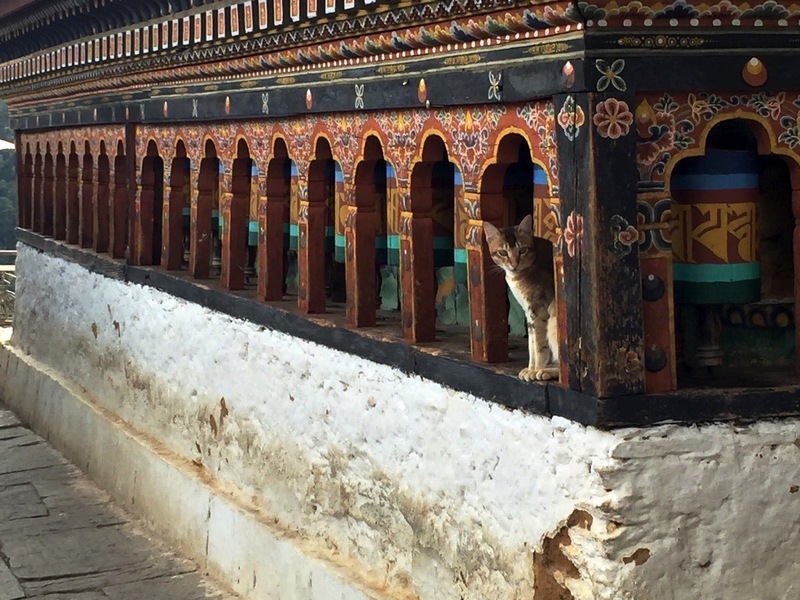 For hundreds of years, animals in Bhutan have learned to view humans not as enemies, not as a threat. 3. 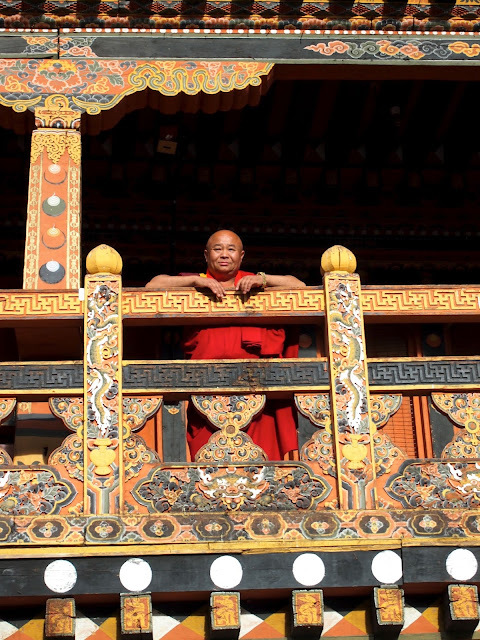 Monk, Punakha Dzong, Punakha. To become a monk or a nun was seen as a very common and wise life choice in Bhutan, where it's more of a vocation than a renunciation to devote one's life to Buddhism. The practice is passing out of normality now, but until recently many families would send at least one member of each generation to a monastery or nunnery. Monastics could earn a little money if they were trained in the performance of rimdro, cleansing ceremonies practiced by most Bhutanese for many purposes: to cure illnesses, to purify a residence, to call for blessings upon births and new beginnings (even new cars received a blessing). Like many chilips, I first viewed monks and nuns with a sort of exaggerated, sycophantic reverence, but after a while I learned that they were just like anyone else: happy, funny, unpretentious people who made the easy choice to devote their lives to contemplation. 4. Memorial Darshing in moonlight, Wamrong. 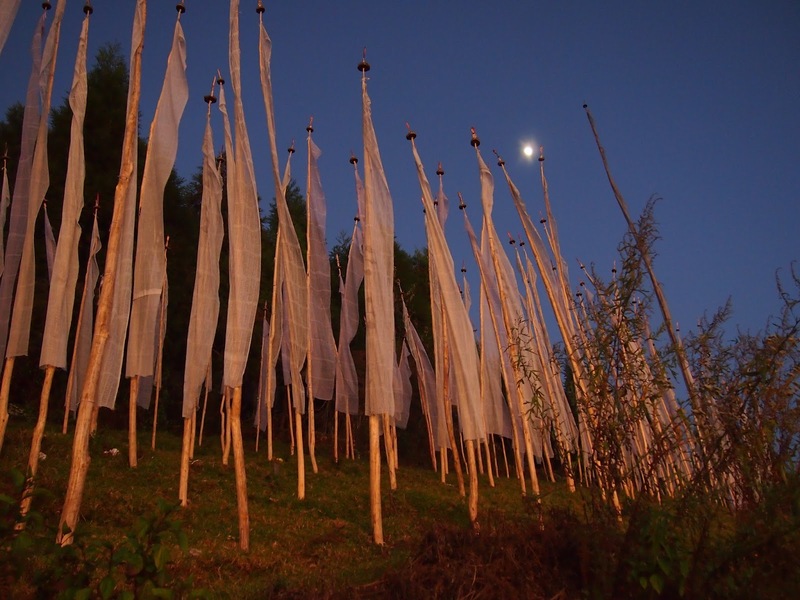 Hillsides throughout Bhutan contained groves of these darshing, which were erected in memory of departed loved ones. Typically, people would erect them on specific anniversaries of a relative's passing, on yong-zangpe (3rd day), gowa-dintsi (7th day), barka-dintsi (14th day), zangtsi (21st day), zhibchu-zhegu (49th day), or most commonly ning-rume (one-year anniversary). I had never met people who were so comfortable with the idea of death. Acceptance of one's mortality is perhaps the most basic element of Buddhism -- not a theoretical acceptance, but a genuine realisation that the price of admission for being born is that we will all die. As such, I was sometimes amazed at how the Bhutanese grieved. I remember attending the cremation of a Class 9 boy who tragically died very suddenly. All of us from the school went and showed tremendous respect at the ceremony. We went back to the school and, rather than being shaken and upset for weeks or months like I would expect, they all went off to play volleyball and enjoy the beautiful afternoon weather. 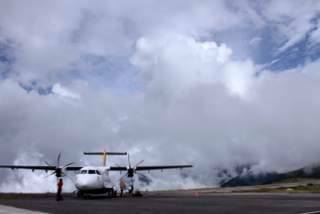 As with many difficulties, the Bhutanese simply said, "what to do, la" and accepted what had come to pass as the past. 5. Cat in the Mani, Cheri Dratshang, Begana. The Bhutanese had this beautiful philosophy that one must treat every animal as if it is your grandmother, because you never know, it just might be her reborn. As a result, animals were (for the most part - not every Bhutanese is a perfect Buddhist, just as not every Italian is the Pope) able to live happily and peacefully, feral but not quite wild. This was never more true than at temples and monasteries, where people would treat resident animals with great respect and reverence, believing them to be holy people returning to their holy places after rebirth. 6. Nun reciting prayers at school Rimdro, Tashitse Higher Secondary School, Wamrong. Every school in Bhutan held a rimdro near the beginning of the school year in order to chase away bad spirits, introduce a positive atmosphere, and pray for the good health and good fortune of the school community. The rimdro would start at about 4:00 in the morning and last until the early evening: more than twelve hours of continuous choeg-lhagpe (reading of scriptures) and ngag (incantation). These were special days for everyone and days that did indeed leave me feeling especially cleansed and happy.